Safe Harbor offers municipal consulting services for both a planned and emergency projects. Safe Harbor is a small environmental consulting group working on and near, Cape Cod's shorelines. Safe Harbor designs compliance techniques to minimize impacts to natural resources during construction projects. Environmental permitting requires careful attention to detail and deadlines. Prior to submission,We develop a site management plan that integrates necessary project sequencing, resource area delineations, various use designations and specific mitigation for construction activity. Safe Harbor provides a built in liaison with regulatory agencies. We attend and participate in public hearings, providing detailed technical responses as necessary. Safe Harbor protects the property owner's liabilities. We study resource areas: sand bars; Eel grass beds; fringe marshes; beaches; and dunes, as Linked Systems, because we believe they respond to energy pulses as systems. The onshore alignment of natural energy interacting with nature based infrastructures creates an intuitive model for studying Coastal Resiliency. Linked resource systems modify transmission of pulse energy. Pulse energy changes may provide clues to how we might use this "Available Energy" to modify coastal geomass. We have successfully explored some innovative strategies, using higher "Pule Energy" to enhance resiliency in a few linked, coastal resource systems. We have multiple projects currently underway. Safe Harbor offers no cost site visits to review and discuss your project. We are experienced with various State and Municipal requirements for Environmental Permitting. Empty bowl on beach shown here with sand bulldozed in. In the Town of Truro at Ryder Beach Town landing for endless years, storms blew beach sand off the beach and over the coastal dune. This left a 20 ft deep eroded, empty bowl on the beach, a blown out beach path and a growing dune on adjacent property every year the town would bulldoze sand back into place. Safe Harbor created a partnership with the Town of Truro Conservation Commission and DPW and the Beach and Recreation Committee, that offered a sustainable solution. When sand was replaced that year, short, 24 inch sand fencing was installed and beach grass was planted. The Town never had to return to the beach. Safe Harbor Coordinated Permitting, Required posting shown here for public information. Town DPW Staff Created an angled pathway to reduce wind erosion. Town DPW Director Paul Morris and Safe Harbor workers take a well deserved break. The 24" fencing not only stabilized the area by reducing erosion but it also began collecting a lot of sand. We added additional layers of fencing and planted beach grass. We added more fencing as the sand collected and planted beach grass. Two years later, the project had stabilized and the town landing are was now protected by sustainable native vegetation. Emergency Consulting for Coastal Communities requires working collaboratively, in compressed time windows within existing permitting matrices, to develop critical assessments of alternatives and facilitate immediate response protocols. Emergency permitting does not bypass the review process but it does change the sequence of the review protocol. Certain environmental conditions trigger thresholds constituting "Emergency Status". Two coastal projects are used below as illustrations of "Emergency Status". Each Town's Conservation Commission may have it's own protocol for determining and responding to, requests for this status. Many towns are unfamiliar with Emergency Permits and have no established protocol. The same perception of emergency status may not be shared by both regulators and property owners. For instance, the catastrophic loss of land to coastal erosion may not, by itself, constitute an emergency. However, if a structure or part of a structure is imperiled, or if it can be demonstrated that a structure is in imminent peril due to that catastrophic erosion, the situation may qualify for status. February, 2013, Truro Cape Cod. Nor'easters are cold core storms, driven by thermal differential. An anomalous convergence of -70 degree Greenland air and + 90 degree Gulf of Mexico air, created an "Atmospheric Bomb" over Cape Cod with lower than hurricane central pressure. This mega nor'easter spread out for nearly a thousand miles with hurricane force winds at the coast. 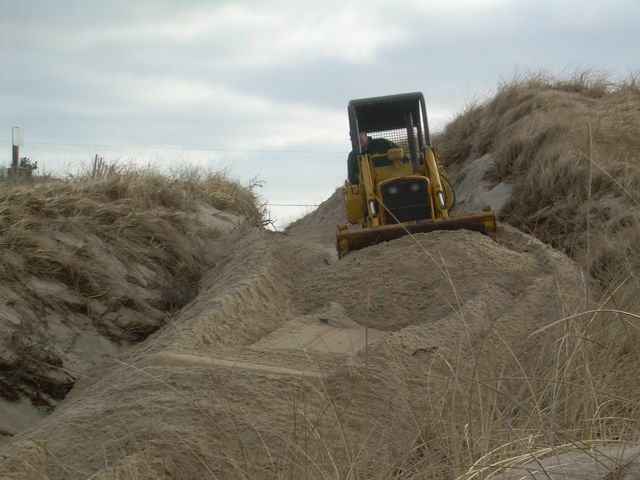 The accompanying surge, linked with duration of wind driven waves, weakened and over washed a hundred foot wide section of barrier coastal dune in Truro, sending flood waters over a mile inland. The overwhelming magnitude of this event on sensitive resource areas, contributed to an initial sense of accepting the default scenario: The opening will close over time. Two additional mega nor'easters came in quick succession. The 100 foot wide breach widened to 200 feet. Chronic flooding began impacting 84 homes. Terrestrial and fresh water ecosystems, wells, septic systems, building foundations and livestock were now so imminently threatened that further risks became unacceptable. Safe Harbor Environmental provided Emergency Consulting Services to the Truro's Emergency Management Team. Community response goals were conflicted by differential priorities of a major, Federal abutter with intertwined property whose Management Plan did not address emergency response protocol or private property at risk. Any Federal Permitting could take 90 days. The abutter also had a policy of "no response" to coastal breaches. While the dialogue over coastal erosion cause and effect links to anthropogenic or natural events is a worthy one, it was no longer germane. The abutter's were unable to allow the town to cross their property with sand or to place sand in the ongoing breach, which they felt was on their property. Poor land records and coastal erosion had blurred ownership boundaries. Meanwhile, continued flooding of 84 properties was amplifying the emergency exponentially. Safe Harbor worked to facilitate Emergency Permitting between the Truro Conservation Agent and MA Dept of Environmental Protection (DEP). In Massachusetts, the Wetlands Protection Act has jurisdiction over coastal resources that protect Public Interests, regardless of ownership. DEP granted Emergency Certification in 30 minutes. This facilitated immediate response without lengthy delays for prior permitting. Following Emergency Certification, Truro legally needed a land survey around the breach to determine Town and Federal property boundaries. The Department of Public Works began stockpiling sand that had blown into various beach parking lots from the storms. Once the land survey was complete it turned out that the Town owners the breach area and plans got underway to fill in the opening, in between storms. This story should end here but it doesn't. In emergencies, other emergencies seem to appear. In this case it was the MA Endangered Species Act: "The breach may have created nesting habitat for endangered shorebirds and the Town may not be able to fill it in with new sand". The engineered barrier dune was uniquely configured to accomodate shorebirds while still protecting homes. "Wouldn't it be a shame" I suggested, "if these potential nests were swept away by the continuing over wash?". Safe Harbor ended up engineering a replacement dune of unusual configuration, designed to protect both homes and nesting shorebirds. Within 24 hours of resolving this final hurdle, we passed out field sketches to Town DPW workers and a massive effort kicked into high gear. The 160 foot wide, sloped configuration has beach grass and biomimicry on the crest.